Grilling a skinless, boneless chicken breast sounds like an easy task. 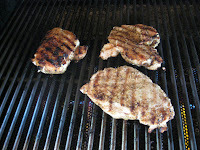 But it can be a challenge to serve a tender, juicy, delicious, properly cooked chicken breast off the grill. Without any skin to keep in the moisture and because of the uneven thickness of chicken breasts, you could end up serving an overcooked, dry piece of meat. Here's an amazing recipe for Cuban style Rosemary chicken breasts that is delicious, juicy and tasty. The keys to success: 1) If needed, gently pound the meat to an even thickness, 2) marinate for at least two hours 3)Be sure the fire is hot and pre-heated, and 4) DO NOT overcook the chicken. Cook for 8-12 minutes maximum. 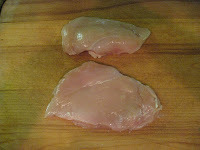 Even out the meat: Sometimes chicken breasts are thick on one side, thin on the other side and then taper to an even thinner tail. First, cut off a little of that thin tail at the end since it will overcook before the rest of the meat is done. If needed, gently pound the thick part of the meat a little bit so that the breast has uniform thickness. Just a bit, not a lot. The meat will now cook evenly, guaranteed. Pound the meat before marinading. Marinade: Marinade is used for flavoring on chicken and this is where we go Cuban. Marinade is not needed for tenderizing since chicken is already tender. Mix some Cuban style mojo (most grocery stores carry it in the condiments section) with a bit of olive oil, marjoram and garlic. 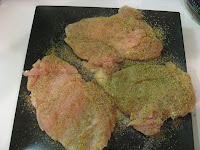 Cover the chicken breasts with the mojo and refrigerate in a pan for at least a couple of hours. I accidentally left the chicken in the mojo for two days, and it turned out yummy! Prepare and season: Take the chicken out of the refrigerator and let it sit at room temperature for at least an hour before grilling. When ready to grill, take the chicken out of the marinade and sprinkle with crushed rosemary, fresh or powdered garlic and salt. (I've also added Merlin's Magic Rub or McCormick's Montreal Chicken seasoning for an additional spice). You can create a new recipe every time you cook chicken! Be generous though - sprinkle or rub the seasoning all over the meat. 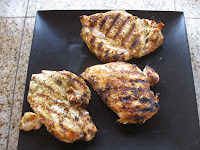 Since olive oil was added to the marinade you don't need to oil the chicken before placing on the grill. It's a good idea though to make sure that all meats you grill are oiled or sprayed with Pam so they don't stick to the grates. Grilling: Let the grill heat for at least ten minutes at high before cooking. Cook over medium high heat for 4-6 minutes on one side then turn and cook for 4-6 minutes on the other side. Turn the meat only once; the more that meat is turned while cooking, the more it will dry out. And by turning only once you'll get nice grill marks. Adjust timing based on the grill heat. Take the meat off after no more than 10-12 minutes! You don't want to overcook a chicken breast or you'll be tasting cardboard. So watch the time! If you're using barbecue sauce, brush on the sauce before the chicken is fully cooked and then cook a couple of minutes more on each side to brown the sauce. There you have it. Tasty, juicy and flavor-filled Cuban style rosemary chicken breasts hot off the grill for a great BBQ dinner. Don't they look delicious!